Sensational cupcakes that are a perfect treat or snack. Mix flour, baking soda, baking powder, and salt together in a medium bowl. Mix milk, oil and vanilla together in a small bowl. In a large bowl, cream together shortening and sugar using an electric mixer on medium speed for 3 minutes. Add flour mixture alternately with milk mixture to the shortening mixture and mix well. Bake at 350 °F for 15-18 minutes. Note: based on a recipe from the "hello cupcake" book. 83 members have added this recipe to their cookbook. I made 1/2 a batch and used lemon extract instead of vanilla....yummy and lite!!!!!! GROSS! Grainy and dry. Who the hell still uses shortening in anything these days?! Homemade pastry and delicous fillings - what could be better. 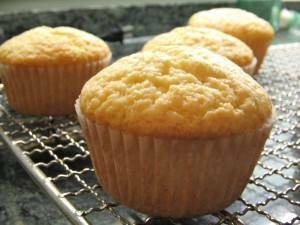 There are 136 calories in 1 serving of Vanilla Cupcakes. Calorie break-down: 51% fat, 43% carbs, 5% protein.